Can a homeowner build a natural swimming pool without professional assistance? The short answer is no. An NSP is a well-balanced wetlands ecosystem that incorporates limnology, hydraulics, hydroponics, and modern pool construction methods. The whole system needs to be planned and crafted by an experienced landscape architect or pool builder who is knowledgeable in this very precise art. What are the benefits of a natural swimming pool? 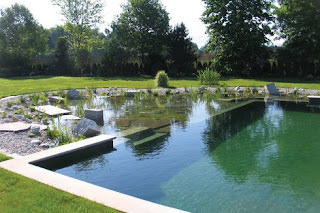 Will algae grow in a natural swimming pool?